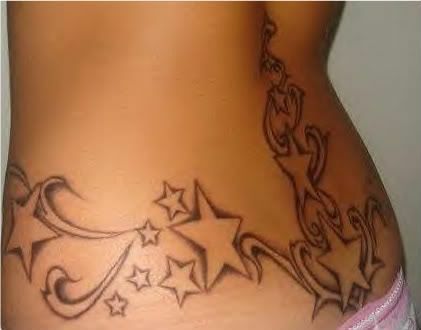 This girl’s tattoo includes several star outlines and swirl designs inked in black on her waist and lower back. This large star tattoo is unique because the whole tattoo is designed in outlines; none of the stars or swirls are filled in with ink. The tat is located on this girl’s waist and also extends from her mid to lower back. The five-pointed star tattoo design is cute and girly, and probably gets a whole lot of attention when she wears a bikini! Star tattoos are popular among women in particular because they are typically pretty designs and can stand for a number of different things. 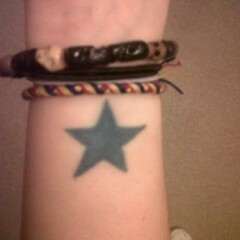 Some star tats are meant to represent a loved one and others symbolize safety and protection. Some of the first star tattoos were nautical tattoos inked on the arms of sailors as a way to get home safely when out to sea.